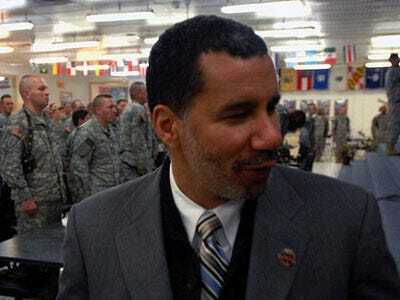 Another night, another bombshell from The New York Times concerning lame-duck governor David Paterson.This time they’re basically filling in what they left blank the last time: Last week, the paper reported that David Paterson personally talked to the woman that had accused his aide David W. Johnson of violently attacking her. And it was reported that Paterson’s secret police had contacted her as well. But what they didn’t quite say was that Paterson orchestrated the effort to contact her, and get her to recant or drop her charges against Johnson. According to one person who was briefed on the matter, the governor instructed his press secretary, Marissa Shorenstein, to ask the woman to publicly describe the episode as nonviolent, contradicting her accounts to the police and in court. Mr. Paterson also enlisted another state employee, Deneane Brown, a mutual friend of the governor and the accuser, to make contact with the woman before she was due in court to finalise an order of protection against the aide. Ms. Brown, an employee of the Division of Housing and Community Renewal, reached out to the woman on more than one occasion over a period of several days, and arranged a phone call between the governor and the woman. This is not the first time Shorenstein’s been put up to this type of task. She was the one who last year denied to New York City tabloids that Paterson had appointed an ex-girlfriend to a key post in Washington DC — a claim the NYC busted in its second piece in this now four-piece series. Though Paterson announced last week that he would not seek re-election, that didn’t silence the demands (largely from members of his own party) that he resign. Now that the NYT has finally connected the dots, those calls will get much louder.